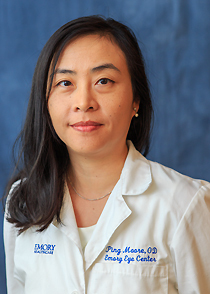 Ping Moore, OD, is an assistant professor of Ophthalmology in the section of Comprehensive Ophthalmology, Vision and Optical Services, Emory Eye Center. Dr. Moore’s emphasis is in primary care and ocular disease. She provides full-scope optometric care including glasses and contact lenses and the management of ocular health. She has served as a volunteer with the Georgia Lions Lighthouse, provided vision screenings at the Special Olympics (Atlanta), and several other volunteer services outside Georgia. Her research interests are in cylindrical adaptation with spectacles in astigmatic and non-astigmatic persons and Fabry’s disease and conditions associated with meibomian gland dysfunction and dry eye therapy. Dr. Moore is a member of the Georgia Optometry Association (2010-present), the American Optometric Association (2003-present) and the Massachusetts Society of Optometry (2003-2010). Honors/awards include: Optometric Glaucoma Society Residency Program Recipient (2007); NEI Travel Grant, ARVO (2006); and Howard Hughes Scholar (1998).